“Rosé per favore,” I confidently instructed the waitress after she’d asked which variety of wine I’d like with my dinner. I was taken aback when she gave me a confused look in response. “Err, rosado?” I attempted, and suddenly there was a flicker of recognition. “Ahh, rosato,” she replied – a mixuture of amusement and relief showing on her face. A week into our Italian adventure and I still couldn’t order dinner, why didn’t I think to pack the Italian phrasebook rather than grabbing random French and Spanish words from obscure corners of my memory? Italian motorways: A bit like playing Ridge Racer. 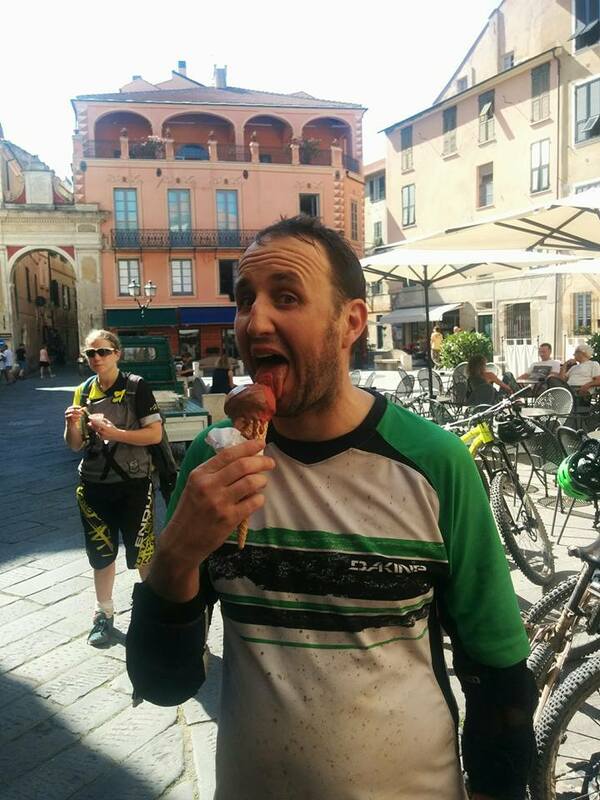 Our roughly bi-annual MTB trip usually involves a long schlep down to the Alps, touring resorts like Morzine, Chatel, Pila, Verbier and Alp d’Huez – but this year we decided to make it an exclusively Italian affair. 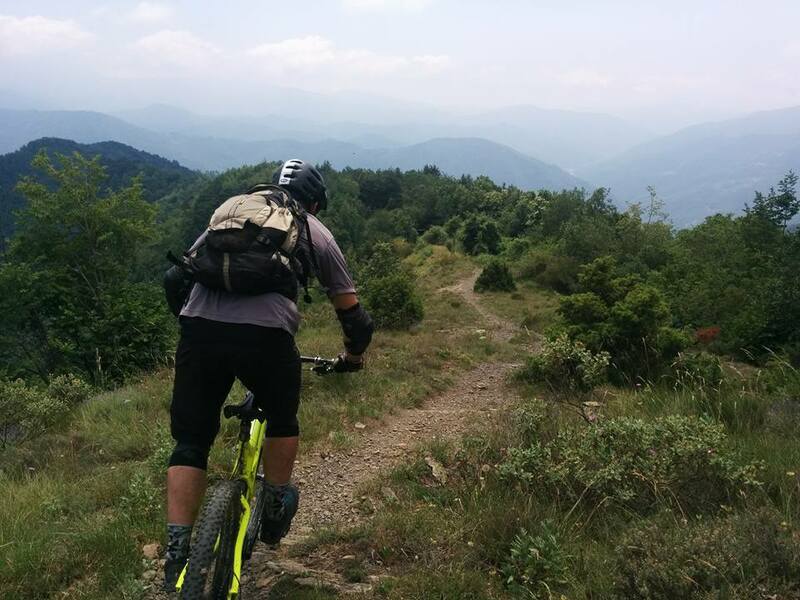 This meant a two-centre visit to the Italian Riviera; Finale Ligure and Molini – with a cheeky day at Pila on the way down. After a smooth and dry drive across France, the heavens opened when we hit the Alps – and the rain intensified as we took an unplanned and ill-advised detour through Switzerland to avoid a big queue at the Mont Blanc Tunnel. To our genuine surprise we emerged from the Grand Saint Bernard tunnel to see the Aosta Valley bathed in the same bright sunlight that it has always delivered for us. We knew Pila wouldn’t let us down… or would it? Sometimes the logistics of a journey dictate riding in a less-than-ideal order, and having hardly ridden any DH trails this year the steep, dusty and braking-bump heavy trails at Pila were a bit of an eye-opener. The famous Pila to Aosta Feeride run has always been a highlight of previous trips, with a seemingly endless series of dusty corners livened up with the odd little drop or jump. However this year it was clear that its popularity has been taking a toll on the trail – with most of the brief straight sections (there are a LOT of corners) now covered in braking bumps. This meant that even riding a coil-sprung freeride bike, I got the worst battering I can remember since my damping died at Antur Stiniog. We clocked up four runs down to Aosta and more runs from the top of the bike park, where I finally started to get my eye in and my speed up on the flowy, jumpy red DH trail in the afternoon. Pedaling back to the van at the end of the final run, my left crankarm actually fell off my bike as we approached the lift station – so the bike was obviously feeling as battered as me. Driving south from Aosta we were briefly caught in a traffic jam of weekenders heading back to the cities of northern Italy – and it was surprising how quickly the hills dropped away to be replaced by the disturbingly flat plain of the Po valley. 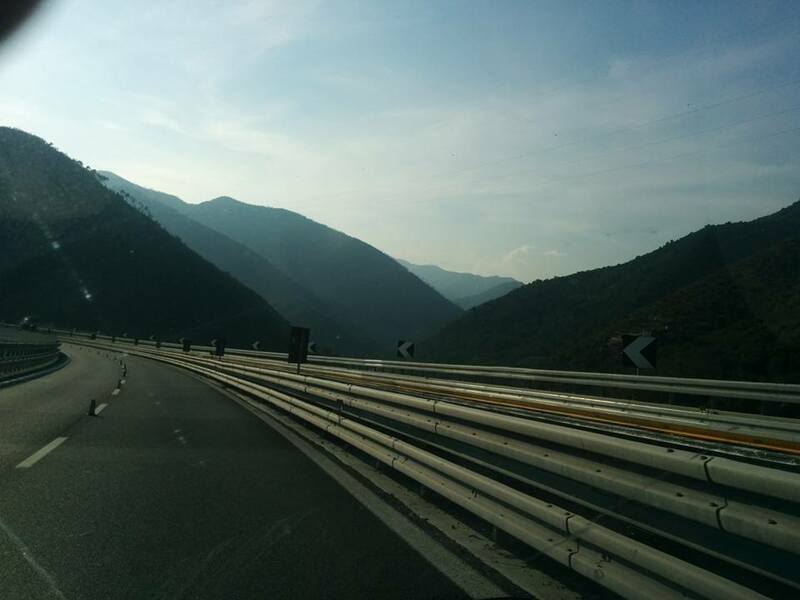 Turning westward and driving across the billiard table-flat plain in 30 degree heat (with broken air con) for couple of hours, we reached the lower, tree-covered hills of Liguria – with the road cutting through them via a series of tunnels and bridges. These got exponentially more impressive as we reached the coast road, where the motorway seemed to constantly be either held up on huge stilts or burrowing through hillsides. 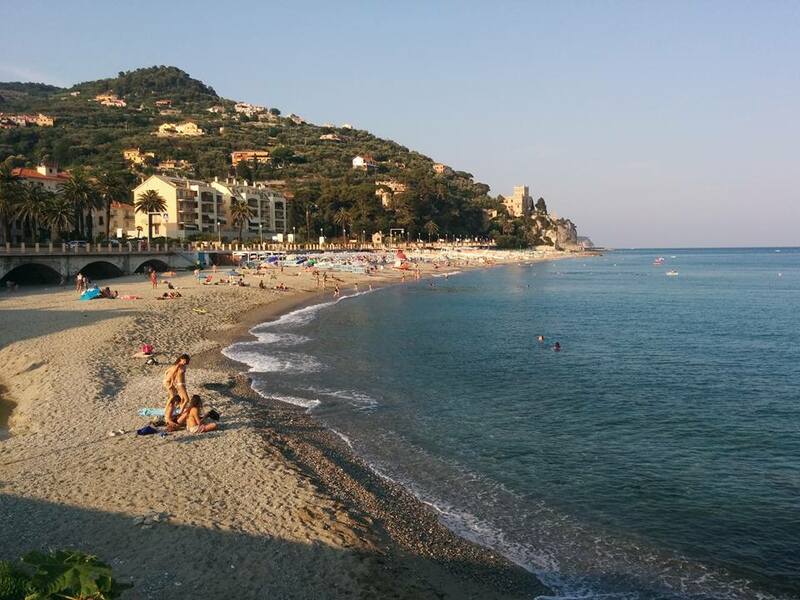 The beach at Finale Ligure. Hitting Finale after dark, we eventually located our accommodation (booked via AirBnB) and were amused to discover that six of us were sharing a one-bedroom apartment. And since me and Ian had arrived last, we were sharing a bunk bed in the same room as a couple. It was also at this point that I realised I hadn’t packed any underpants – and thanks to a recently broken nose, I was snoring like a champ. Sorry guys! Making the switch to enduro bikes the next morning, we hot-footed it down to the Finale Freeride compound on the edge of town – and were soon loaded onto a Land Rover with trailer for the firm’s “Defender Tour” (referring to the mode of transport, I assume). I’d kind of expected gnarly rocks and dust from Finale, so it was a surprise to be treated to smooth, flowing singletrack through the trees – with loads of really well-made little features. It was easy stuff compared to Pila, but just what we needed as we nursed our blistered hands, sore thighs and pummeled forearms back to life. While most of the trails were fast and smooth, the thick vegetation meant that quick reactions were required as you’d often not know which way a trail turned until you burst through overhanging foliage on a rise -with the corner right there. Ian showing a corner who’s boss on Rollercoaster. The technicality was gradually stepped up in the afternoon and we finished with Rollercoaster – a long and fast run back down towards Finale with a gnarly rock garden and some steeper, looser sections. The lovingly built and maintained Defender trails are apparently exclusive to Finale Freeride – due to a deal with the landowner – and are highly recommended for a first day’s riding or for a mixed-ability group. The next day we were scheduled for the “Classic Tour”, which focused on the trails closer to Finale and began at the cool, abandoned Nato Base at the top of one of the local hills. The trails we rode in the morning were like bigger, more rugged versions of the ones on the Defender Tour. Fast and flowy with well-built, natural-feeling berms and the odd floaty jump or drop – I found these trails easier to ride on sight, if only because you could actually see a bit further down them. After another long, multi-course lunch – something that was to become a feature of the trip – we were shuttled back up the hill to take on some gnarlier trails which delivered the dust and rocks I’d been expecting from the area. Sadly it was somewhere between “The Engineer” and another run at “Rollercoaster” that my shock – a Cane Creek DBinline that was just a few rides old – decided I’d had enough rebound damping. This meant I had to tackle “Madonna della Guardia” – probably the gnarliest thing we rode in Finale – with the rear of the bike clanging and kicking back all the way down the hill. Of course I wouldn’t be daft enough to pin my entire holiday on a DBinline (having had issues with another before) – and I had a spare Monarch swapped onto the bike before some of the others had even taken their pads off at the end of the ride. Day three was our finale in Finale and we started it with a shuttle up to the Nato Base for a run down “Madre Nature” (I think), which had been one of the highlights of the previous day – with a delicious combination of corners, drops, jumps and more corners. Then it was over to leg-power for the rest of the day as friendly Frenchman Guillame guided us – and we winched ourselves the few hundred metres back up to the base one last time. Next up was one of the highlights of the holiday for me, a super-fast, off-camber trail called Crestino – which was often sunken into the ground like a toboggan run (hence the name) and featured the odd impromptu kicker. A bit more open and faster than some of the tracks we’d been riding, it was just one of those trails that you can hit flat out blind, drifting corners and laughing your head off. Lunch saw a bit of a debate on which trail to finish on, and somehow we all ended up twiddling another 300m uphill on the road in the mid-day heat to check out a track called “Little Champery”. Fortunately it wasn’t quite as steep as the legendary Swiss World Cup track, but with plenty of the local yellow bedrock and some sharp switchbacks it was a fitting challenge to end our Finale experience on. Finale ended with a big gelato. Planned by Chris with his typical ruthless efficiency and determination not to miss a second’s riding time, the schedule saw us moving on to Molini that evening – but we managed to squeeze in a quick visit to the beach on the way. So just a few hours later we found ourselves salt-encrusted and settling into the Santo Spirito hotel in Molini, a pleasant mid-range hotel that felt like The Ritz after our digs in Finale. Only Ian had to endure my snoring at this point, but we were both soon using earplugs anyway as the church bells ring on the hour every hour through the night. Apparently it’s a fiercely protected local tradition, the reason for which is lost in the mists of time. Anyway, make sure you pack wax earplugs if you’re visiting. We’d been impressed with the scenery as we drove up from the coast the previous evening, and our warm-up ride with RivieraBike main man Ady on our first morning gave us a chance to see more of the stunning Valle Argentina – with it’s steep, thickly wooded slopes, traditional villages and boulder-strewn river gorges. Yes, it’s quite scenic around Molini. While the trails in Finale had been great fun and very well maintained, they had an almost bike-parky feel due to the amount of work they’d received and the volume of traffic. 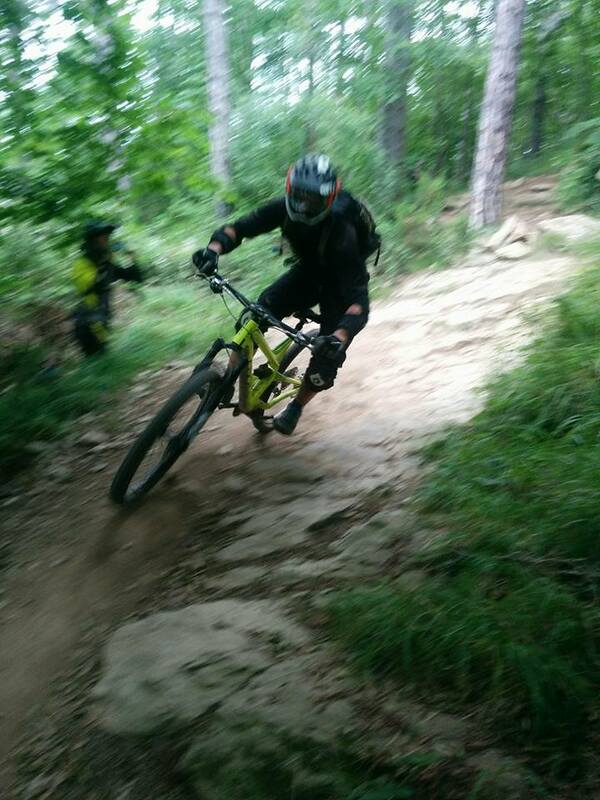 It was obvious straight away that Molini was quite different, with the trails feeling more natural and wilder. We quickly realised that we couldn’t rely on corners being banked up to help us carry speed or on the obvious line being the right one to take in all situations. The trails required a bit more interpretation on the hoof – and were more varied, partly thanks to the bigger elevation differential and partly just because the trail network covers a wider area. This suited us just fine anyway, and it was great to go out on a long ride involving shuttle up 900m and a pedal up another 400m or so to the trailhead for a 1,300m descent back to Molini by the name of “Cop Killer”. Starting fast through the trees in a zone with a strangely autumnal feel, it’s standout feature was some rather exposed switchbacks – followed by a more open high-speed section with a drop to one side. This almost saw the trail living up to its name as our resident rozzer Ian somehow managed to bail off the back and hit the ground running while his bike swerved down the steep bank (see video). Mackerel & Laphroaig Racing Trip. Italy 2016 with Riviera Bike from Juan on Vimeo. 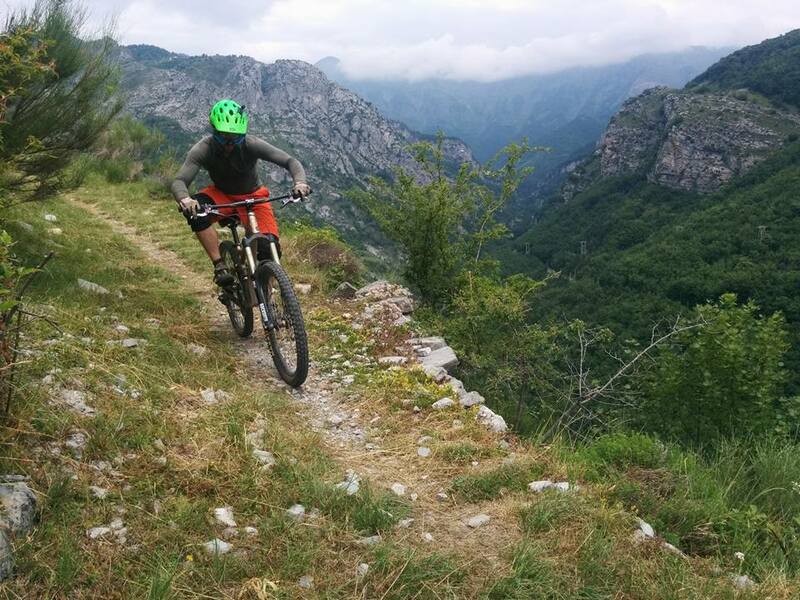 I don’t know if it’s possible to generalise about the trails that we rode in and around Molini, they ranged from the fast, flowy, fun blast of “Mini Golf” and the toboggan run-like “Agrifoglio” to the steep, technical onslaught of “Terra Rossa” – a trail that was just the right side of scary for us. Apart from the higher alpine stuff and a couple of traverses, most of the trails were through the trees – and many seemed to take advantage of old packhorse trails or erosion channels caused by the rain. There were plenty of rocks and a reasonable amount of dust, but being in the shade of the trees most of the time helped take the edge off as the temperatures were regularly hitting 30 degrees. Wee Pete is a steezy rider. Despite his warning us on day one that he can be a bit grumpy, Ady proved himself a fine host and guide – tailoring the trails to our abilities and responding to our request to do a second “epic” ride instead of more shuttling (we were a bit shuttled out). He’s got an impressive knack for spotting when someone was having trouble with a bit of bike fettling, before swooping in to get them riding again. Did I mention the views were quite impressive? 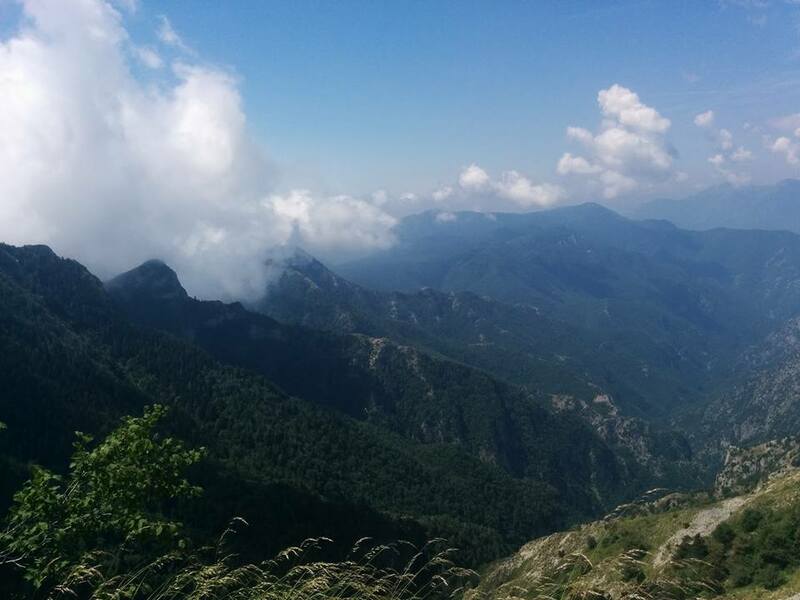 As I mentioned, we usually head to the Alps for our bike holibobs – and while I was aware that Molini was on the edge of the Maritime Alps, I wasn’t really expecting proper mountains for some reason. With peaks over 2,000m, the Ligurian Alps might not be quite as high as the Swiss or French Alps – but are perhaps even more stunning in their way, partly due to the absence of ski-lifts and resorts. If the mountains are a bit more mellow than the high alps, then so is the general vibe. Stopping for a coffee, gelato, panini or four-course meal mid-ride gives the opportunity to soak in the scenery and enjoy a bit of people watching. You’re more likely to bump into sightseers up from the coast or motorbike tourers than other MTBers – we probably saw about three in five days. One of many nice bits of singletrack. 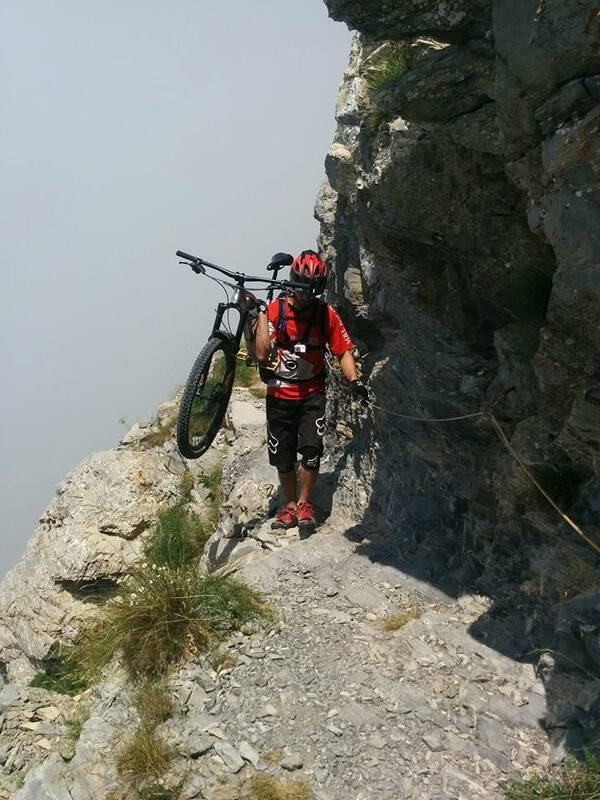 Don’t look down and don’t drop the bike. Our last day of riding was over the mountains from Molini with Nava Freeride, a two-man and one-woman operation set up by guide (and very fast bike rider) Angelo, driver Domenico and Angelo’s wife – whose name I have unfortunately forgotten. 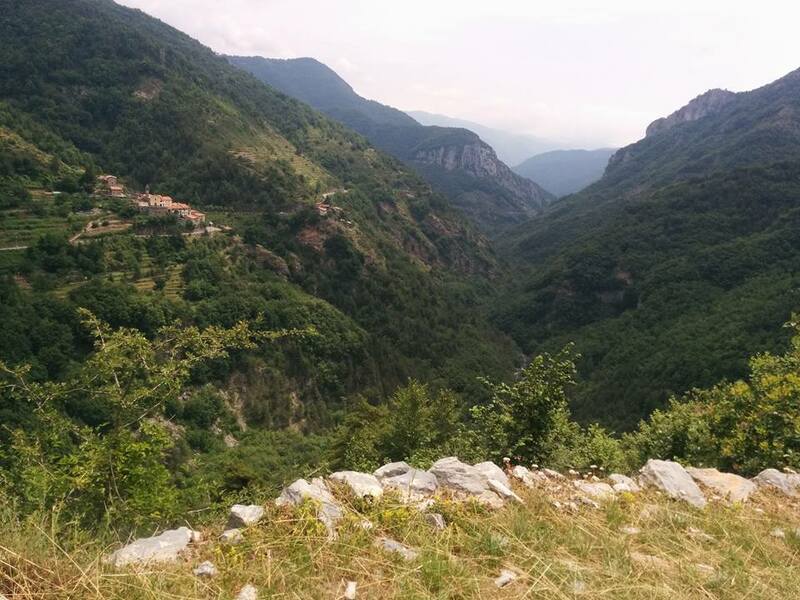 Like Molini, the hills here are steep and wooded, but the valley itself has a more open feel. Just a touch more alpine than the neighbouring valley. 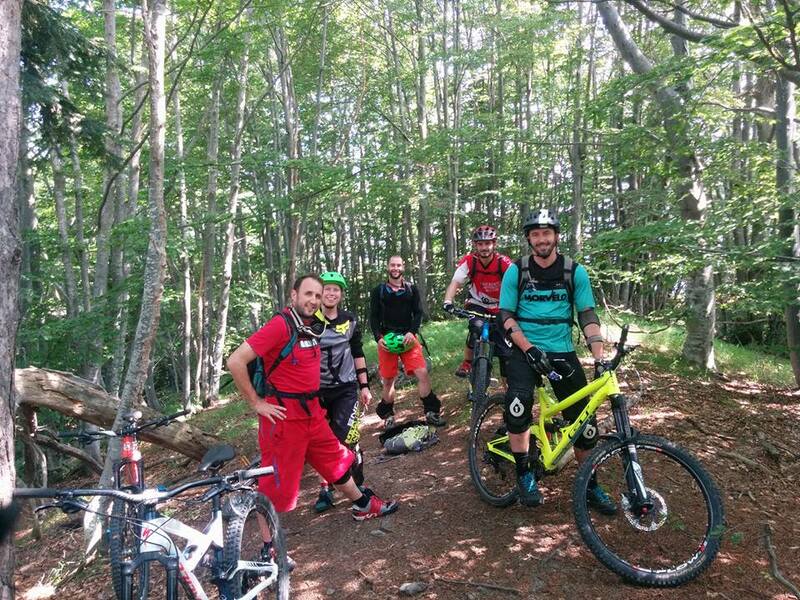 There’s a selection of hand-cut trails bike park-style trails, built and maintained to a really high standard – which we were surprised to hear were created solely by Angelo and Domenico. These guys are grafters! And as well as building the trails, they offer shuttling and guiding in their former police 4×4 meatwagon – which doesn’t offer the most comfortable ride but makes light work of getting up some pretty steep and bumpy access tracks. After a few runs on their main hill, they took us up the other side of the valley to access some longer and more natural-feeling trails – with the highlight of the day involving a push up through the trees before a long, fast, loamy and moderately technical descent that was one of the best we sampled in Italy. It ended with a corkscrew-like run down a rain gulley that left me feeling dizzy and longing for a bit of straight trail. Tired but happy on the last day of riding. Nava Freeride also offer accommodation in a local hotel, which is something we’ve already discussed for our next group trip. You can see more about what they do on their Facebook page, highly recommended! Personally I absolutely loved this trip and really enjoyed the extra holiday vibe it had in comparison to the Alps, where the riding often feels a bit more commoditised and mountain biking often seems like the only thing going on. I just need to remember my Italian phrasebook next time.